The development of a positive self-image and the enjoyment of physical activities are important aspects of any Physical Education programme. Sports also play a major role in tackling social issues, stimulating economic regeneration and giving young people the best possible start in life. From the youngest children who participate in numerous opportunities to run, skip, jump, and hop to the oldest students who are refining their skills and learning team sports, teachers need to challenge each student to develop his or her individual skills and talents. The Physical Education and Sports programme will aim at improving the health and fitness levels of the students at the school. The emphasis will be on engaging every child in every class and teaching skills in an age-appropriate fashion, from the Early Childhood Years to Senior Secondary School. In keeping with the philosophy of the school, Physical Education will be an integral part of every DPS Gurugram Sector 84 day. The Physical Education programme is structured to develop skills, stamina and sportsmanship and fit the needs of particular age groups. 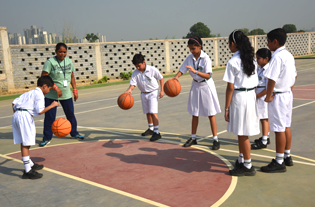 Over and above the School Physical Education programme, sports camps will be organised in the evenings. Specialised coaching and professional physical education programmes will be conducted at DPS Gurugram Sector 84.